For events that call for a wide selection of small, delicious bites, we offer miniature desserts ranging from little fruit tarts, petit fours, and hand-dipped chocolate strawberries to elegant cream puffs and creme brulees. Almond cake with hazelnut cream filling and butter cream frosting. A rich chocolate cake is layered with cherry preserves and airy chantilly cream. Chocolate shavings are sprinkled on top along with maraschino cherry for decoration. Delicately sweet vanilla custard is spread between layers of soft white cake and topped with dark chocolate ganache. For the coffee lover, this cake is filled with cappuccino feuilletine mousse and then decorated with a ganache finish. This dense classic cake is packed with fresh carrots, raisins, nuts and sweetened with fruit juices. A citrus cream cheese icing compliments the rich flavor of this cake. The sides are wrapped with toasted slivered almonds and topped with a small carrot. An intense chocolate cake is filled with caramel cream and caramelized banana pieces. It is then decorated with a warm caramel sauce and chantilly cream. 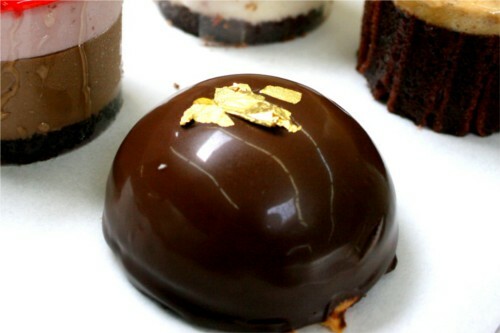 A dome of chocolate mousse over a layer of chocolate cake covered in chocolate ganache and decorated with edible gold. Fresh raspberry puree complements the richness of our dark chocolate cake, which is topped with chantilly cream and a chocolate plaque. Dark chocolate cake layers filled with topped with dark chocolate ganache. A ganache rosette and hand made chocolate plaque decorate this bittersweet chocolate cake, which is truly a chocolate lover's dream. A vanilla cake with coconut rum custard filling and decorated with chantilly cream and then sprinkled with coconut shavings. 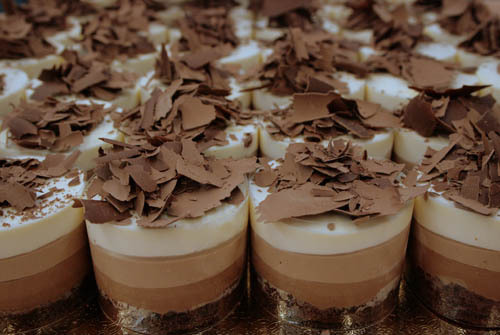 A layer of chocolate cake topped with dark chocolate mousse and white chocolate mousse. This cake is then finished with dark chocolate ganache, handmade chocolate plaque, and a chantilly cream rosette. Silky white chocolate mousse complements the raspberry mousse, which are layered on top of vanilla cake. The cake is topped with raspberry jam and decorated with a whip cream rosette and fresh raspberry. A flourless chocolate cake with chocolate mousse layered on top. It is then finished with a chocolate ganache glaze and topped with a piece of decorative hand made chocolate. A white sponge cake filled with lemon yogurt mousse, covered and garnished with a chantilly cream rosette and hand made chocolate plaque. Mango puree and chunks enhance the fruit flavor of the mango mousse, which is layered in between moist, vanilla cake. This cake is topped with chantilly cream and a chocolate yellow rose. The tangy-sweet flavor of passion fruit adds character to this vanilla cake. Silky chocolate mousse complements the raspberry mousse, which are layered on top of chocolate cake. The cake is topped with raspberry jam and decorated with a chantilly cream rosette. This moist red cake is made with buttermilk. It is filled and top with a cream cheese frosting and sprinkled with red crystal sugar on top. Fresh strawberry puree adds a fruity flavor to this cake. A summer favorite, this vanilla white cake has a layer of strawberries that were infused with Grand Marnier and is topped with light whipped cream and a fresh slice of strawberry. Espresso coffee and rum soaked lady fingers are layered in between mascarpone cream and a rich chocolate cake base. This cake is then decorated with cocoa powder and finely grated chocolate shavings. A soft chocolate cake makes the base of this dessert and then layers of dark, milk, and white chocolate mousses on top. A plain cheesecake with sweet blueberry jam swirls. A classic melt in your mouth dessert made with tangy sour cream, is topped with chantilly cream rosette and a fresh slice of strawberry. This cheesecake is a mixture of cheesecake batter and pumpkin puree, which produces a delicious alternative to pumpkin pie at Thanksgiving. A plain cheesecake with raspberry jam swirls. Our plain cheesecake batter is mixed with sweet potato puree to create a delicious autumn dessert. An array of flavorful cupcakes topped with sweet butter cream frosting. Our cupcakes topped with chocolate shavings and other beautiful decorative details to give it a special touch. Some of our cupcakes can be filled with different creams and custards for an extra special treat! Our original cupcakes decorated for the festive holidays. Please ASK us for the flavor of your choice, custom decorations or logos! Dessert Pastries These are usually small bites of dessert and pastries. Small slices of almond cake with hazelnut cream filling and butter cream frosting. Small slices of raspberry puree and chocolate cake that is filled with chocolate mousse. Small slices of chocolate cake with mocha butter cream filling. Small slices of chocolate and raspberry mousse cake brushed with raspberry jam. Small slices of vanilla cake layered in between a mousse made of fresh lemon curd and lemon yogurt mousse. Small slices of delicate white, vanilla cake with strawberry cream and a passion fruit curd drizzled on top. A traditional French pastry made of layers of puff pastry brushed with raspberry jam, filled with vanilla custard, and decorated with chocolate-vanilla icing. A small slice of soft banana cake with a layer of banana custard rolled in between, and topped with roasted quinoa. A small slice of ganache covered chocolate cake with a layer of tangerine mousse rolled in between. A small slice of green tea cake with a layer of blueberry jam rolled in between, and dusted with powdered sugar. Cake on a stick, what could be more fun than that? These chocolate coated bite size cakes, brownies, and cheesecakes are adorned with fun and colorful decorations and are available with or without a stick. 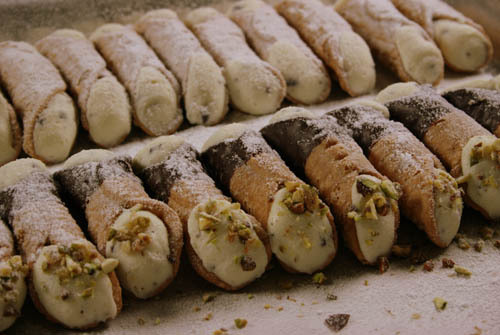 An Italian favorite, pastry filled with ricotta cheese and chopped chocolate chunks. An airy choux pastry is filled with a rich vanilla custard cream and dipped in white chocolate. 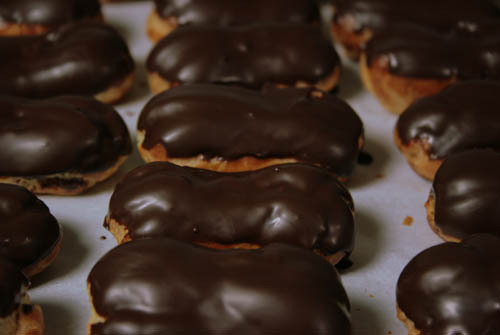 Inspired by French patisseries, our eclair is choux pastry filled with chocolate custard and then dipped in dark chocolate. Perfect for a tea party, our petit fours are mini almond cakes dipped in white, dark chocolate, or color icing, is then decorated. Reminiscent of a swan, this creamy vanilla custard filled puff pastry will delight young and old alike. Sweet cream cheese icing sandwiched between two small cakes of red velvet or chocolate. Apple cinnamon compote baked in a sweet tart shell and topped with crumbs. Creamy vanilla custard baked in a tin cup with a warm caramel base. 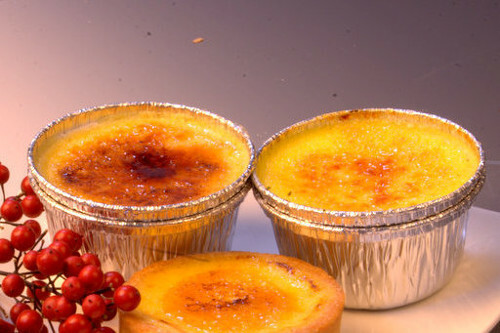 A creamy egg custard baked in a tin cup with burnt sugar on top. A sweet tart shell filled with a rich egg custard and burnt sugar on top. Slices of firm apples are artfully arranged over frangipane. It is then filled with custard cream and topped with a dusting of cinnamon sugar. Slices of juicy pears are decoratively baked over frangipane with vanilla cream. Sweet blueberries are layered atop creamy vanilla custard. 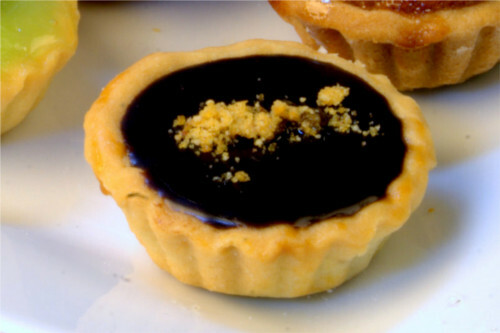 Rich chocolate ganache baked in a sweet butter tart shell. Dark chocolate ganache filled tart topped with gooey caramel sauce and sprinkled with sea salt. A delicious layer of peanut butter lines the bottom of this rich chocolate ganache-filled tart. Fresh raspberries are decoratively arranged on top of this ganache-filled tart and sprinkled with powdered sugar. 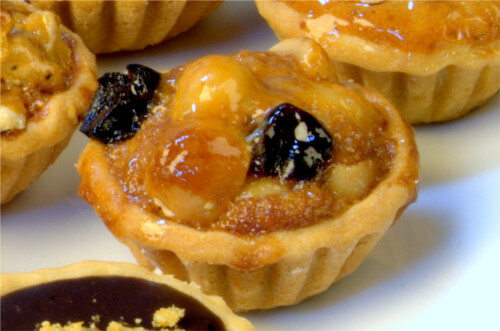 A combination of macadamia nuts, cherry, and shredded coconut gives this tart a distinctive flavor and texture. A slight variation on a quintessential Thanksgiving dessert, our pumpkin puree batter is baked in a sweet tart shell. A fruity tart filled with rhubarb and strawberries and baked with a buttery crumb topping. Seasonal fruits fill this freeform flaky pastry. A simply refreshing treat for fruit lovers.